There has been little coverage of the declaration in North Korean media. Media commentators in countries involved in the six-nation talks with North Korea have given a mixed response to Pyongyang's declaration of its nuclear facilities. Most welcome it as a step which could help ease Pyongyang's international isolation, but some voice the concern that key questions - such as the number of nuclear weapons it possesses, and whether it supplied nuclear information to Syria - have been left unanswered. There has been little coverage of the declaration in North Korean media. The official Rodong Sinmun Daily and Minju Joson Daily newspapers have not been observed to carry any comment on the issue. However, the official government radio station KCBS quoted a statement from the country's foreign ministry saying that Pyongyang welcomes President Bush's announcement the USA would move to remove North Korea from its lists of states sponsoring terrorism. "We evaluate this as a positive measure and welcome it," the statement said. No mention was made of the destruction of the cooling tower at Yongbyon nuclear reactor on Friday. The verdict in the Chinese press was generally positive, though several commentators say that key issues remain to be addressed before any thaw in relations between Pyongyang and Washington can occur. "Giant step towards peace" proclaims a headline in the China Daily. The paper hails the "breakthrough" announcement as "cause for great optimism for peace and stability in the Korean Peninsula and Northeast Asia". The lifting of US sanctions against North Korea could lead to "greater investor confidence" in North Korea, it says. A commentary from China's Xinhua news agency states that the declaration "marked a breakthrough in the denuclearization process" and that North Korea's "new stance" has created "new opportunities" with the possibility of "normalising relations" and achieving "lasting peace and security" in Northeast Asia. But a commentator in leading Beijing daily Renmin Ribao, is more cautious, saying "we still have to examine whether North Korea's declaration will fully and accurately reveal all of its nuclear programmes - and whether all parties concerned will honour their promises". The Shanghai Morning Post says that if North Korea does not keep its side of the bargain, then "the issue will receive little attention during the US presidential election, and after the new government is formed, the de-listing of North Korea as a 'terrorism sponsoring nation' would then be delayed". "Will the new host of the Oval Office take a new line towards North Korea?" asks Xinhua Wang, predicting a "long and exhausting process" ahead. In Japan, commentators are more circumspect. Many criticise the Bush administration for making concessions to Pyongyang, and one even suggests that US-Japanese relations could now be in jeopardy. The centre-right Yomiuri Shimbon, Japan's largest daily, says: "It cannot be called a 'complete and accurate' declaration if it did not state that nuclear weapons should be abandoned." It adds that if North Korea "took a deceitful strategy or broke the agreement, the United States should immediately withdraw its policy of removing sanctions". The country's leading business daily Nihon Keizai Shimbun is fiercely critical of the diplomatic concessions made to North Korea, and accuses the US president of playing into North Korea's hands. It asks George W Bush: "Do you want to go down in history as the president who made the decision to lose his most important ally across the Pacific Ocean?" The centre-left Asahi Shimbun gives the declaration a cautious welcome, calling it an "important step." The paper also pointed out that the process of removing sanctions against North Korea may be reversed by Washington "if there was fabrication in the declaration". Tokyo Shimbun says conducting a "detailed examination of the content of the declaration" is an "immediate task" for the six-party talks. In Russia, the story was largely overshadowed by news of the national football team's defeat to Spain in Euro 2008, but it did make the front page of newspaper Vremya Novostey. The article, entitled "Nuclear openness" says that North Korea has made an "unprecedented" step. The declaration receives a similarly positive verdict in Rossiyskaya Gazeta, which says it is "destined to make history as one of the most important landmarks of nuclear disarmament". "It is possible that this sets a precedent for a procedure under which other de-facto nuclear states will give up their ambitions to create this type of weapon of mass destruction." South Korean newspapers are hopeful that the statement could mark the end of Pyongyang's nuclear ambitions, but warn that the North Korean leadership may not honour its commitments. In its editorial, the Korea Herald warns of "a long road ahead" for negotiators. Of the declaration, it says: "The document is flawed. Glaringly absent is the number of nuclear weapons North Korea has developed". It also says George W Bush should expect no diplomatic favours from Pyongyang, since "the Kim regimes have time and again proven to be two of the hardest nuts to crack for members of the international community". The Korea Times is "disappointed" with the report, but nonetheless describes it as a "positive move". "We hope the North will enjoy economic aid, security guarantees and diplomatic incentives in return for its complete nuclear disarmament," it says. 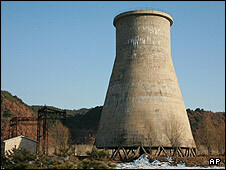 The Daily NK website, which focuses on news from North Korea, says the destruction of the Yongbyon cooling tower is unlikely to ever be shown on North Korean television, since it was the symbol "by which [Kim Jong-Il] made the people believe North Korea was facing up to the global power, the United States".